Here's something Dirk, Cleveland, and Sanders didn't notice about that 1878 picture. Ellen was standing and her sister Elizabeth was sitting. Elizabeth was holding a book. That's odd and here is why: In Victorian photographs, the head of the family or the most accomplished or the most literate would be the one sitting and holding the book. Others might be standing or sitting and holding nothing. Accordingly, an 1865 family portrait has both James and Ellen White sitting and holding books while one son is standing and the other is sitting, neither holding books. By 1878 Ellen White had already authored not a few books and articles, and claimed to have had visions besides. By worldly standards she should have had the seat of honor in that picture, but she chose instead for her much-loved twin sister to have that place of honor. This gives us a little insight into Ellen White's character and humility. Note: A "ten dollar pin" in 1891 is equivalent to a $205 pin in 2005.5 This could hardly be considered a cheap piece of jewelry. Dirk and Cleveland claim that Ellen White wore this pin "on many occasions," which certainly appears to be the case, until one notices the date of the letter from which this quote comes from. According to their footnote 4, the letter was written on December 7, 1891. But her birthday a few days after receiving the gift was on November 26 that same year. If we assume that she left Honolulu on November 24, a few days before the 26th, then we know she wore it from November 24 to December 7, a period of about two weeks. For a number of years, the references on Dirk's web page appeared within the text, but sometime in 2004 or 2005 the references were moved into footnotes, including the date of the letter. This makes it more difficult to notice that "worn it ever since" and "on many occasions" means but two weeks. So was the $10 pin just a brooch? Probably. Since she said it was "serviceable," it must have had some sort of utilitarian function. Additionally, since she said it was "very plain," and since it didn't cost her one cent, it appears that it wasn't contrary to her principles (or to Finney's or Wesley's or Spurgeon's principles) to wear such an item. How much longer than two weeks did she wear the pin? Whatever became of it? Who knows, but perhaps the fate of her gold watch (see below) gives us an indication. Whether Ellen White was wearing a gold watch in Dirk's picture we cannot say, since the picture is black and white. But in an 1885 talk at Basle, Switzerland, Ellen White admitted to wearing a gold watch for a time, and thus it is possible that she was wearing that very watch in that 1878 picture. Let each one study the plain teachings of the Scriptures as to simplicity and plainness of dress and by faithful obedience to those teachings strive to set a worthy example to the world and to those new in the faith. God does not want any one person to be conscience for another. Talk of the love and humility of Jesus; but do not encourage the brethren and sisters to engage in picking flaws in the dress or appearance of one another.—Historical Sketches, p. 122. Hmm. So though she believed in simplicity of dress and abstaining from jewelry, she didn't think we should be critical and judgmental. There are few of my brethren and sisters who maintain plainness of dress as I do. My writings are pointed on this subject; but I do not carry it in the front. It is not to be made of greater importance than the solemn, testing truths for this time.—Ibid., p. 123. Sounds reasonable. Though she believed that following Peter and Paul's counsel on jewelry was important, she didn't think it the most important truth out there, and didn't go around making a big deal about it. When the subject of dress is dwelt upon explicitly, there are some who feel all the burden over it that they ought to feel for a soul balancing between life and death. I once attended a meeting where this spirit existed. There was the most solemn interest that I ever saw. Seventy-five were baptized before the meeting closed. After speaking to the crowd in public, I labored for the youth privately, talking and praying with them as they came to my tent. Many were greatly blessed; but there was a company on the ground who had no burden. I could hear their idle conversation, their trifling laugh, while agonizing prayer was being offered for the unconverted. In the height of the interest, one of this number came to me and said that some were in trial because Sister White wore gold.—Ibid. So Dirk, Cleveland, and Sanders' concern over dress is nothing new. But what was the grounds for their concern back then? Some time before, I had received a present of a little open-faced, gold watch. It was very ancient in appearance, and certainly never would have been worn for its beauty. I carried it because it was a good timekeeper.—Ibid. Though Peter, Paul, Wesley, Spurgeon, and Finney all counselled against the wearing of jewelry, they might not have had a problem with this little, not-so-pretty, watch. Especially is this so since Ellen White had not squandered a bunch of money on it that could have been given to the poor or missions instead. So what happened to the watch? But in order to avoid all occasion for any to stumble, I sold the watch, and I would recommend that others follow a similar course. This is in harmony with the teaching of the apostle Paul, who says: "Wherefore, if meat make my brother to offend, I will eat no flesh while the world standeth, lest I make my brother to offend."—Ibid. Really? She sold her watch just to avoid being a stumbling block? Our guess is that the $10 pin met the same fate. All the religion many have is to pick flaws. I once knew a lady whose religion was of just this character, and in her family she was so overbearing that they could hardly live with her. A tent-meeting was held near the place where she lived, but instead of taking hold to help those who were laboring very hard in the meetings, or to receive help herself, this woman stood back to criticise. On returning to the house one day, I found her searching my trunk to see if there was not some article of clothing in it that she could condemn.—Ibid. We shall ever have just such people to deal with in this world. But if we do not enter too much into particulars, they will have no excuse for indulging their natural disposition. It is a marvel to me what patience the Lord has with such crooked material.—Ibid. 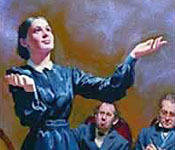 Ellen White stands accused of contradicting her position on jewelry by wearing watches and pinning her collar together with brooches, though she never condemned the wearing of simple watches or brooches. If for the sake of discussion we assume that she is guilty as charged and that she is consequently a false prophet, we have a problem. Our perpetual concern is that we never prove Ellen White to be a false prophet with arguments that could undermine our confidence in Scripture. Sometimes the Bible writers, being fallible human beings, made mistakes or were a little inconsistent. For example, Moses constantly preached that Israel must obey God, but he himself disobeyed the Lord when he smote the rock instead of speaking to it (Num. 20:8-12). For that he was punished by not being able to take Israel into Canaan. King David once committed adultery and murder. We hesitate to condemn him as a false prophet in consequence. Jesus said that we could discern true prophets from false prophets by their fruits (Mat. 7:15-20). But by this we doubt that Jesus meant occasional mistakes or inconsistencies, as in when Peter had to be rebuked (Gal. 2:11-14), or when Paul caused a riot (Acts 23:6-10; 24:20, 21). We know that some of our readers feel that the Bible is a myth, and thus have no problem with this, but we definitely do have a problem with such conclusions. We feel that this whole discussion regarding Ellen White's use of watches and brooches is based on a premise that undermines faith in the Bible. Did Ellen White contradict herself on jewelry by wearing a watch? He's right. She said we shouldn't wear jewelry, and a pocket watch is jewelry. She was definitely contradicting herself. Maybe there was nothing wrong with wearing the watch, but brooches are another matter. She should have used a straight pin. You mean that the best example of Ellen White's contradicting herself was that she wore a pocket watch? How absurd! Why didn't Dirk tell us that it was a pocket watch? All his page says is that it was a chain. It seems a bit shady to not tell us.